In the last couple of weeks I have been invited to attend two events for academic researchers focusing on different non-academic career pathways and skills. I have been asked to talk about my career journey so far, and about combining science with business. This, alongside Nadia (our Scientific Liaison) asking 'Do you think you follow a standard scientific career path or is your journey significantly different from others' in her recent interview of Aubrey de Grey for DNAdigest, has caused me to reflect a bit on my journey so far. What is this post about? Me. More explicitly, my career path to date, and the factors and decisions that lead me here. Why should you read it? If you are a researcher who is thinking of leaving academia, or if you are generally interested in the transition from academia to business, this might be interesting for you. What will you get from this post? You will learn the true story of my transition from working at a leading research institute to a job in a biotech startup. Hopefully, this will give you a better idea of the options available to you, if you are thinking of leaving academia. Stick around to the end and I'll explain this diagram! At 17 I spent a week in Jenny Southgate's cancer research lab at York University. This was the beginning of a fruitful obsession with biology. During my second year of studying Physiological sciences at Oxford I conducted my research dissertation in Simon Davis' T cell biology lab at the WIMM. Here I helped develop a novel mutagenesis strategy to investigate buried surface in protein complexes on T cells. After I finished my undergraduate I headed to the University Hospital of Zürich (UniversitätsSpital Zürich) to work as a research assistant in Adriano Aguzzi's neuropathology lab. Here I investigated the factors involved in amyloid A clearance. I took 6 months off to travel South America (I highly advise doing this!!). In 2011 I started a 4 year PhD in Anne O'Garra's Immunology lab at the NIMR (now the Francis Crick Institute). I successfully graduated with a thesis on transcriptomics and the regulation of immuno-modulatory protein gene expression. Then I made the big jump from Academia. I did a 3 month internship in some obscure biotech startup called Repositive. ... 18 months later I'm still at Repositive and am now Product Manager. After 10 years of only thinking of a career in research, leaving academia was scary, but for me, it was one of the best decisions I ever made. When trying to figure out what I wanted to do with my life I tried to establish what 'things' I like to do and what I would like my job to involve. After some experience in the academic world I could see that a career in research would probably tick the 5 things I like. In fact, at that time I couldn't think of any other field in which I could experiment and question like I could in research. In retrospect, I had very little awareness of what other career paths could offer. It is so hard to know what jobs are out there and what they might involve. Without talking to loads of people and trying a whole bunch of things, it is very easy to see your career through a telescope - aiming for that tiny distant goal without seeing all the other scenery around it. People leave academia for many reasons, so I won’t dwell on this, except to say that by the middle of my PhD I felt like I wasn't actually covering 3. and 4. of the things I like (working with people & feeling like I'm making a difference). There is a great sketch called The illustrated guide to a Ph.D., part of which I have shamelessly copied and pasted below. Click the link above to see it all, it's genius. This really clearly illustrates how I was feeling by the middle of my PhD – giving my all to make an insignificant mark on the world. The only person who cares about your PhD is you. 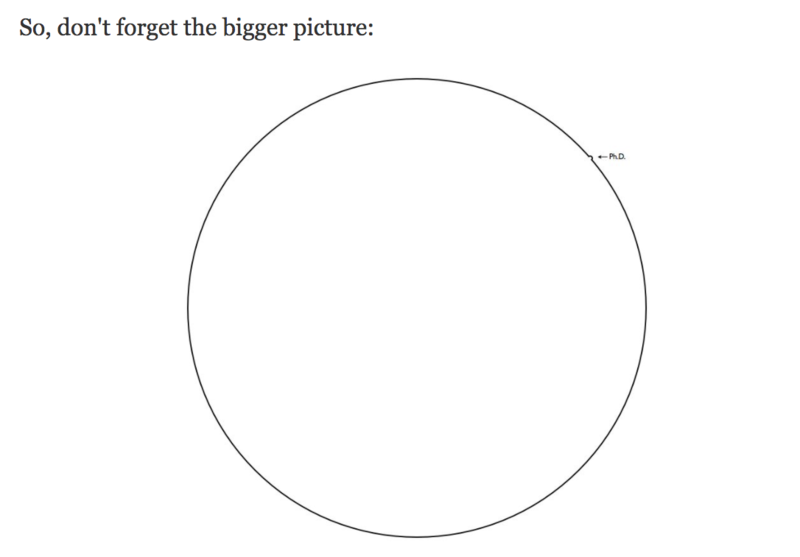 This sketch is so true, your whole world revolves around your PhD, but in the long run you are making only the tiniest dent on human knowledge, and therefore even a tinier dent on society. Furthermore, when I looked at it rationally, it's a pretty steep pyramid in research. As Alexandre Afonso points out in this great post, Academia Resembles a Drug Gang. People at the bottom are ready to forgo wages and employment security in exchange for the prospect of uncertain security, prestige, freedom and reasonably high salaries. I'm clearly not cut out to be a drug dealer, the prospect of possibly making it to the top of the academic pyramid isn't enough for me to forgo wages and security. Unless you are truly committed and very lucky, you won't make it to the top. I wasn't really that committed and I hadn't been particularly lucky - so I took the big decision to cut and run. Making the decision to leave at all was a huge struggle. After all those years dedicating my life to research, and having spent forever looking down that telescope, it was pretty scary to think I might have to start over. This wasn't helped by the general academic attitude towards people who choose to leave - you are either thought of as a traitor if you go to pharma, or a failure if you leave research completely (and if you go into teaching, well you're basically disowned!). Were there other jobs out there? Were there other jobs I could do? Was I qualified for anything else? Did I have any relevant skills? The answer to all of those questions is YES, loads. As a PhD, you can basically go on to do anything you might like. The hardest part isn't getting a job, it's figuring out what you want to do. You will see some or all of these skills on almost all job descriptions for any role. Yes, some roles are technical and require some very specific hard skills - sorry to break your bubble but unless you re-train you won't be able to hop into one of those roles. But if you're not looking for one of those roles, or if you are willing to re-train, then you are basically qualified to do many different jobs. To figure out what I wanted to do, now that I had decided to leave academia, I went back to those 5 things I like. 'All' I needed to do was find a job that covered those 5 things. For me it wasn't about the actual day to day job but how I would feel about that job and what I would get from it. So I didn't choose to apply for a specific type job, like 'accountancy' or 'management consultancy' I choose to apply for anything that hit my 5 things. One piece of advice (for anyone applying for a job, no matter how qualified you are) is you will have to apply for a lot of jobs and you will have to learn to deal with rejection. I applied for a lot of jobs, in a lot of different fields, and got a lot of rejections. But I also got a lot of interviews and even some offers! The jobs I applied to mostly didn’t require PhD level education and I was a bit of an obscurity, but it didn’t stop them being interested. Most employers see having a PhD as a sign that you are smart and can work hard. Their main reservations are that you may not be a great team player – so you will have to prove them wrong. I'd never thought to look for roles at startups - I had no idea what they really were and had no idea how I would apply my skills. It was an even more hidden and obscure world than the corporate one. But then, as it is with these things, one day I met the cool CEO and the rather scary Scientific Liaison from some startup I'd never heard of (called Repositive!). After a great chat they asked me if I would be interested in coming to do a User Experience (UX) session with them, then they asked me if I wanted to do an internship with them, then they gave me a full time position, and the rest is history. I have found that generally startups aren’t looking for super experienced, highly qualified candidates. Mostly because they can’t afford them! But also because in the startup working environment buying into the mission and being the right culture fit are crucial. You can learn the hard skills you need to do a job, it’s the soft skills and attitude that matters. 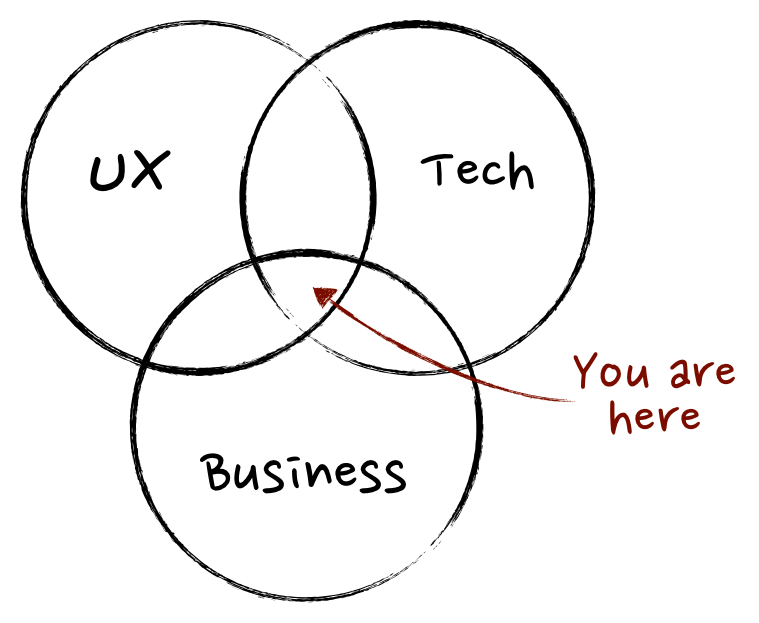 Honestly, I'm probably not the best person to tell you what a product manager does, and there are lots and lots of resources out there you can read if you really want to know. But this great diagram from Martin Eriksson gives you a reasonable idea. I think every product manager role is different and really depends on the product you are building, the type and size of the company you're in, and what you choose to make of it. I would like to highlight, however, that being the first product manager in a small startup is a completely different job from being part of a product management team in a large well-established company. More drug dealer chat - maybe I am destined to be one! To bring together the needs to the user, the strategy for the business and the capacity of the development team. We prioritise what needs to be built, attempt to maintain focus within the team, and try to remove all obstacles in the way of the team so they can just build build build! At Repositive we are building a community platform for human genomic data access and reuse. Our aim is to build a software platform to facilitate efficient and secure data access, data sharing and data collaborations for genomic research. We are a (rapidly growing) team of 14, predominantly consisting of ex-academics and web developers. Why did Repositive choose me? If I had stayed in academia I would have been one of Repositive's users. This means I understand the workflows and mindsets of our community. Aside from the soft skills my PhD gave me, the genomic data analysis and small amount of Python coding I had done were very valuable to the company. Why did I choose Repositive? The mission and the team. 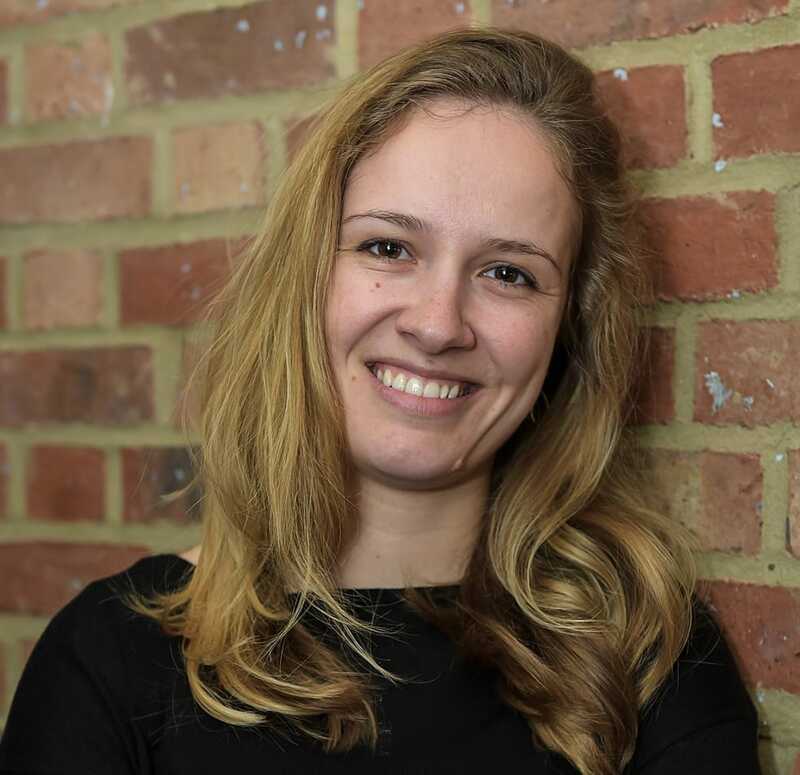 If you met our CEO Fiona you would understand, she is infectiously driven and enthusiastic about our mission and the difference we can make. I bought into that mission, and at Repositive there is a brilliant team of people that I really wanted to be part of. What do 'I' do as a Product Manager? As I said, I prioritise what needs to built, attempt to maintain focus within the team, and try to remove all obstacles in the way of the team. Experiment and question. I am always trying out new things, whether that's new ways of testing the usability of our product, trying new processes with the team to optimise our work, or getting new features onto our platform. I spend my life questioning the decisions that I make and that we make as a team, trying to fill in all the gaps so we don't make (too many) mistakes. Build 'stuff'nI see my ideas, our team and the ideas of our users becoming real features. I can then see our product being used and loved (or hated) by the users. Work with people. All day, every day. We are all cogs in a machine, and to run smoothly we all need to be involved. It's frustrating and rewarding all at once. Make a difference. My team needs me, that in itself is a great feeling. But even more than that, I get the mission of the company, I can see us making peoples' lives that little bit smoother and a little bit less painful. I see that often, whenever I chat to our users. Am an 'authority'nI'm almost certainly not doing as good a job as a super experienced product manager would be. But I'm in a startup, we are the blind leading the blind! I know more about our product and our users than anyone else in the team, and when they have questions, they come to me. My drop is fulfilling me, it feels like a much bigger drop than it did in my PhD. To sum up my thoughts I just wanted to impart something I have found working in a startup - It's not all that different from working in lab. I would say it's a lot more similar than working in a big corporation. 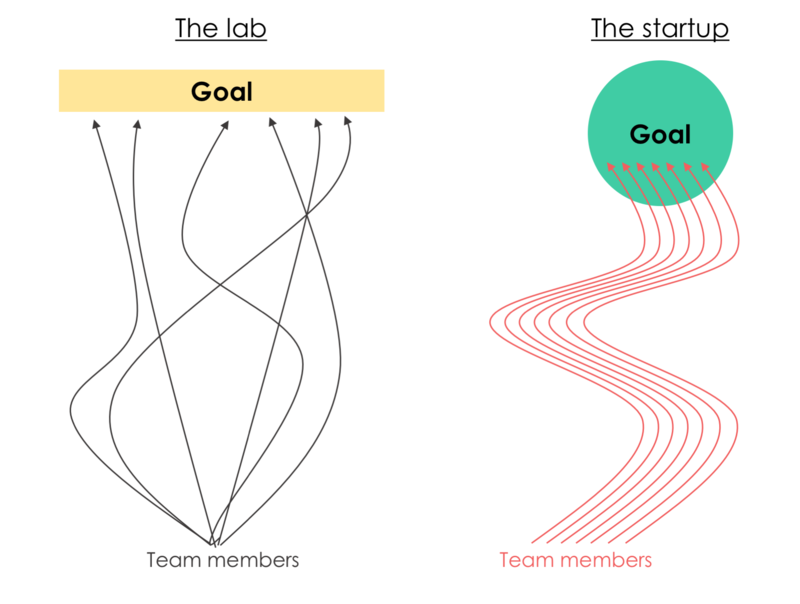 Both labs and startups are small teams working towards the same goal. However, in a lab you all have broadly similar skills, and are all working towards a similar goal, but not an identical goal. You have different projects, that sometimes overlap. In a startup, you all have very different skill sets, and are all working towards an identical goal (if you are well aligned). Each of us works on different aspects of the same project, in parallel. In the end, you have to find what is right for you. But for me, at Repositive, I get to do the '5 things I like' I have a huge amount of responsibility, it's constantly chaos, generally we have no idea what we should do, but we figure it out, together - as a team. I would never have had the opportunities I have had at Repositive if I had stayed in academia or if I had entered a big corporation. Startup life isn't for everyone, but it's definitely for me!